Sightseeing buses were once the cinderallas of the fleet, old double-deckers shorn of their roof parading slowly around historic cities and seafonts for perhaps a few months of the year. With increasing popularity and longer seasons, operators realised that easier access and lower emissions were essential to sustainability resulting in significant numbers of new build and converted late model low floor open top vehicles entering service in the past ten years. Now the City of York has taken a step further, launching what is claimed to be the world’s first retrofitted all electric double deck sightseeing bus. 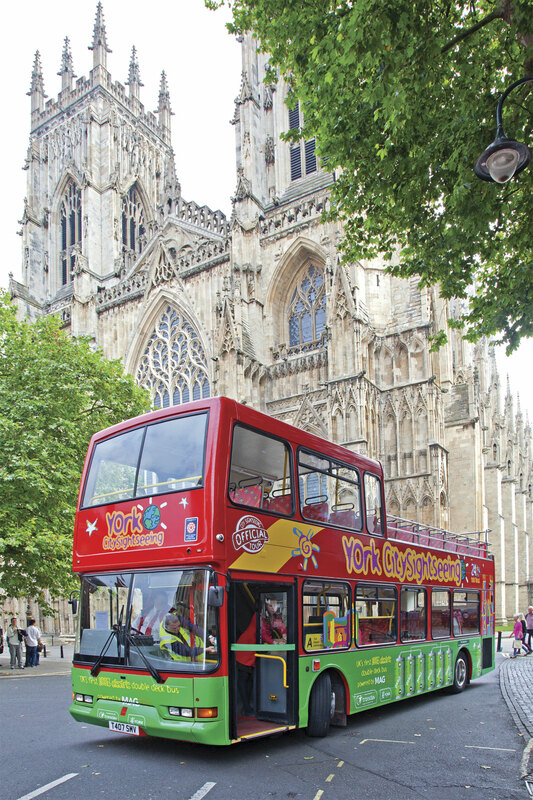 York’s partners in the project are City Sightseeing, the vehicle’s operator Transdev and Sheffield based Magtec who have carried out the conversion. Representatives from the partners joined press, public and city organisations for a formal launch outside York Minster last week, the location emphasising the city’s heritage buildings which the council and residents alike wish to shield from the impact of pollution. Under the extensive tree growth that now surrounds the Minster and will also benefit from improved air quality, a ribbon was strung across the vehicle’s doorway and formally cut by the stakeholders but the speeches were reserved for the press release! Following the formal launch, guests were taken on a tour of the city with a City Sightseeing guide, the vehicle being driven by Magtec’s driver with a Transdev navigator. With no engine noise to overcome, it was easy to hear the guide’s PA system as he regaled his audience with stories of famous residents from York’s past, many of whom appeared to be quite shady characters! 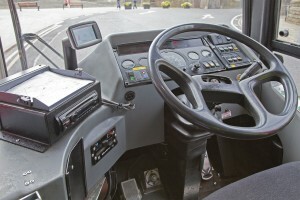 Travelling on the top deck of the vehicle was a different experience with the lack of vibration when stationary at stops or traffic lights particularly noticable. There was some noise from the air compressor although this was not intrusive and was quieter than many, a Magtec representative commenting the noise from this was more noticeable with the lack of diesel engine and they were tuning this down in the next week. York’s electric double decker is based on a 1999 East Lancashire Coachbuilders bodied Dennis Trident from the Transdev York fleet. The vehicle started life with two doorways on TfL services in London operated by Metrobus. In 2006, it passed with two similar vehicles to York based Top Line Travel where it was converted to partial open top and single doorway for the City Sightseeing operation. Top Line Travel became part of Transdev Blazefield in 2008. 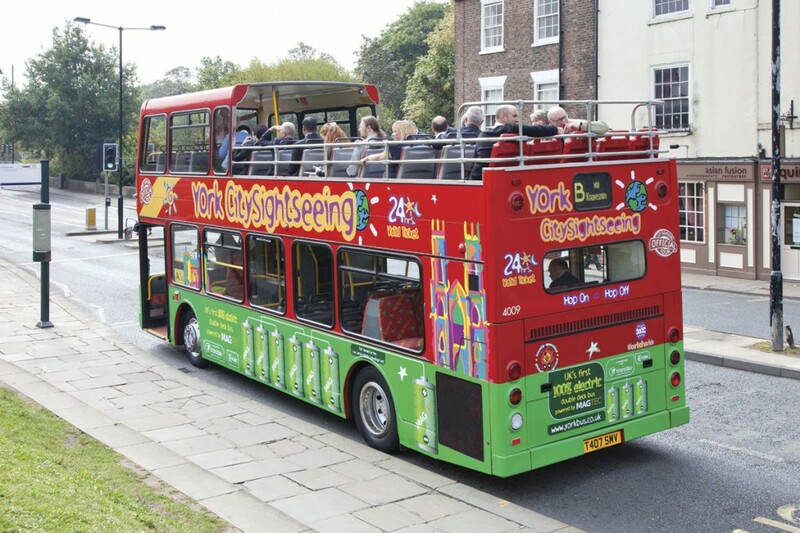 Now finished in City Sightseeing’s red livery with green lower panels promoting its electric propulsion, it had spent some of its York life in a black ‘Terrible Tales’ livery recalling the seedier side of York’s history as referred to by the guide during the launch programme. Without the external branding, the retrofitted vehicle would be visually almost indistinguishable from its previous guise. Magtec have worked on the principle of retaining as much as possible of the vehicle structure and control systems. 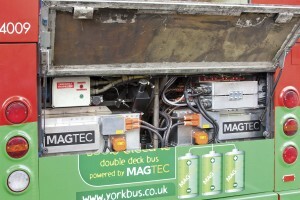 Magtec Chairman, Marcus Jenkins, talked of removing some 2.1 tonnes of metal within the engine compartment and its replacement by the self contained pallet mounted battery, control system and motor pack, giving an overall reduction in vehicle weight of 200kg and thus no impact on its passenger capacity. He added that the weight reduction and the empty space available from the redundant fuel tank provided the opportunity for range extender technology to be fitted that would double the useable range. The Lithium Iron Phosphate battery pack with a design capacity of 133kWh is in two modules with separate controllers, thus minimising the likelihood of the vehicle being stranded in the unlikely event of a battery pack or control system failure. The batteries power a 150kW electric motor that delivers 3,000Nm torque allowing the vehicle to be successfully tested on Sheffield’s Jenkin Road, the long 1 in 5 gradient featured in this year’s Tour de France. Charging takes place overnight at Transdev’s York depot where facilities were already installed for the electric vehicle used on a university campus service. Fully charging the bus is expected to take eight hours overnight when off-peak low carbon generated electricity is available. The battery packs are designed for many thousand charging cycles without memory effect. In tests the vehicle has performed above the expected 0.67 miles per kWh giving a maximum theoretical range of over 90 miles between charges. The practical maximum daily range has been set at 76 miles which is comfortably above the 55-65 mile duty cycles of the York City Sightseeing vehicles. In service, the vehicle is expected to save 33tonnes of CO2 and 535kg of NOx per year at point of use in addition to a fuel cost saving. A new electrically driven compressor has been installed but where possible the retention of on board systems has minimised the variations to be notified when re-licensing the vehicle. The existing braking system is retained with the addition of active and passive regeneration that will reduce energy consumption as well as brake pad wear and its associated fine particle emissions. Passive regeneration occurs when the power pedal is released, simulating transmission drag effects. Active regeneration comes on in stages as the brake pedal is depressed with the normal braking system bringing the vehicle to a stand. Existing instrumentation is retained with an additional display for battery status added to the left of the main instrument panel. Following the launch and tour of the city, the vehicle was to return to Sheffield for Magtec to finalise with the intention of it entering service in York from the middle of September. The City Sightseeing York tour is operated by Transdev from its depot at Fulford Road to the south of the city. Five vehicles are currently allocated to the tour including two more low floor Tridents similar to the one converted to electric operation and two high capacity step entrance Olympians originating with Lothian Transport. The service runs throughout the year with guides employed for the summer period and multi-lingual commentary available on some vehicles. Following the successful introduction of the first vehicle, Transdev Finance and Commercial Director, Jim Wallace, advised they were likely to look at ways of funding the conversion of further vehicles, which would also require the replacement of the Olympians with accessible vehicles. It was intended to use the first partial open top electric vehicle throughout the year for which driver’s cab heating will be installed, consideration is also being given to refresh the vehicle’s interior and seating. Jim said Transdev’s initial experience with electric vehicles had been positive with one in service at Harrogate in addition to the Campus Shuttle vehicle in York. The company had put resources into training drivers on the optimum use of the vehicles with the result that two of the Campus Shuttle drivers were now achieving 100 miles on a single charge. 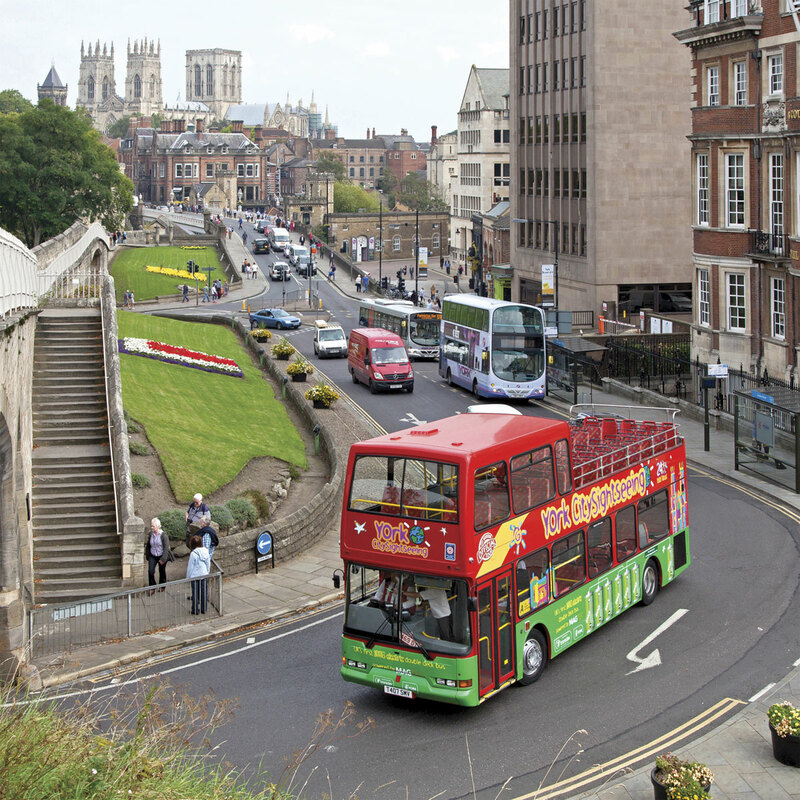 With a total allocation of around 25 vehicles, the York depot also operates diesel vehicles on the high frequency cross city Unibus service in partnership with York University and on local services to the west and north of the city. 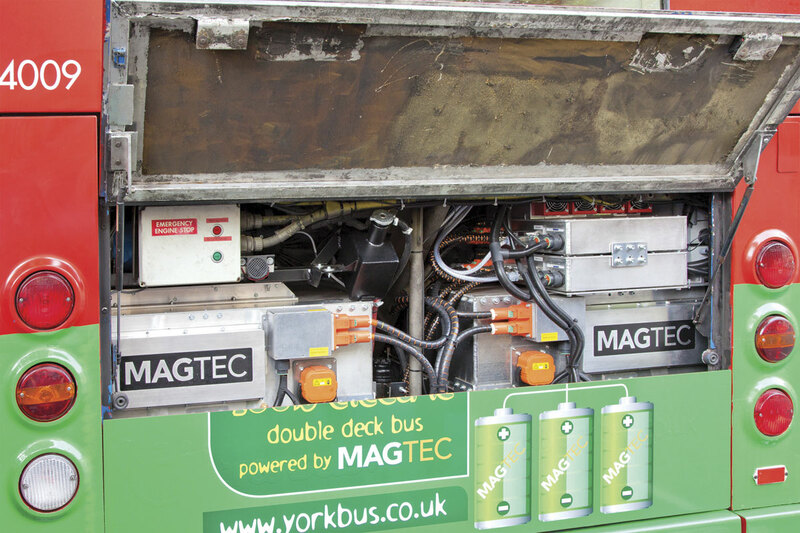 In addition to the retrofitted double decker, Magtec are providing the electric drive train systems for all the Optare EVs currently entering service in York. Founded in 1992, the company designs and builds electric drive systems for a wide range of vehicles including sports and military applications at its facilities in Sheffield. The company’s first production hybrid electric drive systems for buses were supplied to the USA in 1999. In the UK, Magtec electric drive systems have also been installed in the Optare EVs recently supplied for service in Nottingham, Stranraer and Hounslow, London. 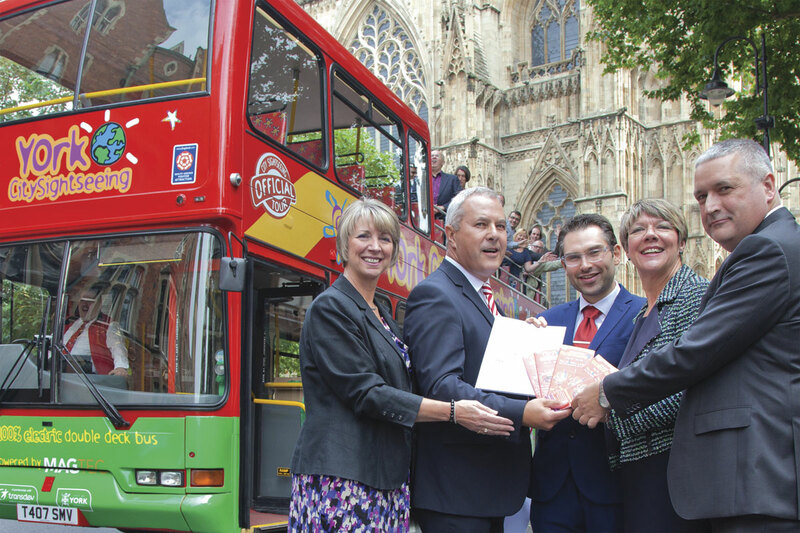 Adding to the Clean Bus Technology Award for the open top bus, City of York Council was also successful in its bid for a total of £1,388,000 in 2013 through DfT’s Green Bus Funding. This is being used to finance the 15 full electric vehicles that are currently entering service in the city. Already in service are six Optare Versa EVs operated by First on the service to the new Park and Ride at Poppleton Bar and the Optare Solo EV operated by Transdev on the University Campus shuttle. These will be joined during September by six further Versa EVs for the Monks Cross Park and Ride, one of the other five Park and Ride services which provide facilities on each major route approaching the city. The final two vehicles, more Solo EVs, have been built but the timescale for their introduction to service will depend on the occupancy of the new Derwenthorpe development on the Rowntree Estate which it is intended to serve. Derek McCreadie, Low Emissions Officer at City of York Council sees the 16 vehicles as the start of a drive to full electrification of local bus services. The city adopted a Low Emission Strategy, the first in the UK, in 2012. The aim is for 80% of bus movements to be fully electric by 2018. York’s electrification programme also extends to other passenger vehicles with the first all electric taxi in service alongside 17 hybrid taxis. All the electric vehicles from York’s current programme are ‘plug-in’ with recharging facilities at depots and Park and Ride sites. Recharging facilities for private vehicles are also provided with over 40 charging bays in York. In addition to funding for the electric vehicle programme, City of York Council has received £23,400 from the Clean Bus Technology Fund to retrofit two vehicles from the Reliance Buses fleet which operate into York, with SCRT exhaust treatment technology to reduce NOx and particle emissions. York. like many historic cities, has a fine heritage and a high density of pedestrians in the city centre, all of whom will benefit from the emission reductions that the introduction of electric vehicles will bring. Sightseeing buses are often slow moving older vehicles with long periods spent idling so if their conversion proves commercially viable following this initial funded example, a significant impact can be made on air quality.